Do invasive prey drive rapid evolution in long-lived predators? Morphological changes in an endangered predator challenge long-standing views. The year was 2011. We were witnessing a major impact of a highly invasive prey. Evidence was mounting that the invasive island apple snail (Pomacea maculata) was having widespread effects on the federally endangered snail kite (Rostrhamus sociabilis), potentially saving the species from near extinction in the United States. Yet from foraging observations collected earlier in the decade (2003-2007), we knew that snail kites had difficulties handling the huge snail--it is 2 to 5 times larger than its native prey (Figure 1). Around that time (2000-2007), the snail kite had experienced a major population decline, plummeting from approximately 3500 to 700 birds in only a decade. There were mounting concerns that the population may be near extinction and that the invasion of this novel prey was a new potential threat to the species. Figure 1. 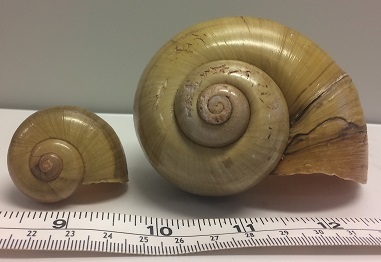 A Florida applesnail (Pomacea paludosa), the native prey of snail kites, and the much larger island applesnail (Pomacea maculata). Nonetheless, over the next few years, the population started rebounding. Monitoring data showed that juvenile kites were surviving their first year of life better, and that several aspects of reproduction were improving. "What if their beaks are getting bigger?" I repeated this statement to Chris Cattau, a Ph.D. student working on snail kites. Chris was critical of this idea. He surmised that kites were learning how to handle snails better or perhaps learning to forage on the smaller, younger individual snails. These ideas were very reasonable hypotheses. "Please, just look…Just check our morphology data," I pleaded. We had been collecting morphological measurements of snail kites at fledgling since 2003 (Figure 2). These data could provide answers to the question. Figure 2. When snail kites fledge, biologists place unique alpha-numeric bands on them and take morphological measurements, such as measuring tarsus length (shown here). Two weeks later, Chris came into my office. He was quiet but holding a piece of paper. He laid it on my desk. It was a box plot of snail kite beak size as a function of year. Beak size had been increasing every year since the invasion. Figure 3. The beak of a fledgling snail kite. Beak size has increased substantially with the invasion of the island applesnail. I was amazed. But why? Was rapid evolution occurring? Was this change in morphology driven by phenotypic plasticity? We needed to know. Our monitoring of the population was fortuitous because it allowed us to develop pedigrees that illustrate family relationships and quantify micro-evolutionary change in wild populations. We could estimate genetic and environmental variance of morphological traits and quantify whether selection was occurring. All of these data made sense: selection was operating on juvenile kites, where with the invasion, larger billed birds survived their first year of life much better. We also found that beak size had a large amount of genetic variance, and that more genetic variance was expressed post invasion, indicative of 'cryptic genetic variation' that may facilitate rapid evolution under environmental change. But bill size changed remarkably fast, increasing approximately 1 SD in less than 8 years. This rate of change could not be predicted based on quantitative genetic data. Snail kites are long-lived birds with a generation time of approximately 5-8 years. We also knew that in invaded wetlands, nestlings grew faster than in non-invaded wetlands. Taken together, these data emphasized that the rapid change we were witnessing was driven primarily by phenotypic plasticity, but that all components were in place for micro-evolutionary change to proceed in the coming years. What are the long-term implications? 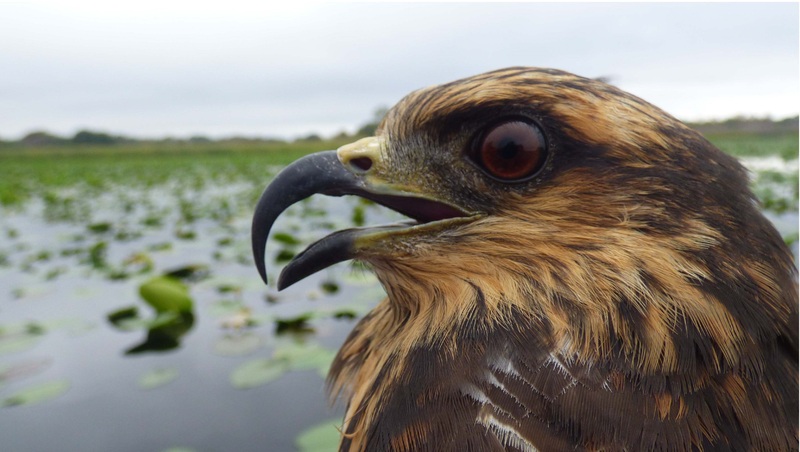 Will snail kites evolve to this invasive prey? Only time can tell. But what we do know is that this long-lived predator had incredibly rapid responses to the invasive prey, challenging long-held views on rapid evolution and phenotypic change in top predators.